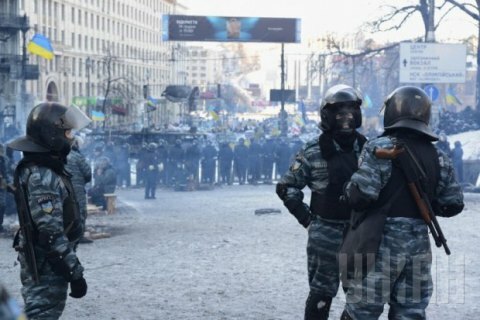 Investigators of the Prosecutor General's Office of Ukraine (PGO) have detained four Berkut [police special forces] officers of the Ukrainian Interior Ministry's Main Department in Kharkiv Region, who are suspected of crimes against Maydan Square protests, spokeswoman for Ukraine's PGO Larysa Sarhan wrote on Facebook. According to Sarhan, the detention took place on 23 June. The spokeswoman informed that former Berkut officers were suspected of having committed actions, in the execution of a manifestly criminal order, aimed at illegal obstruction of holding meetings, rallies, marches and demonstrations and abuse of power and official authority, which resulted in serious injuries to 35 citizens, as well as the commission of premeditated murder of two or more persons on preliminary arrangement by a group of persons. Sarhan added that one of the detainees was charged with committing murder of one person during those events. At the public prosecutor's request, the court ruled to remand all the suspects in custody. The PGO investigators have conducted a number of searches, during which they have detected and seized weapons and ammunition at the suspects' places of residence, as well as other items and things that have evidentiary value in the pre-trial investigation of the criminal procedure. The pre-trial investigation is underway. Sarhan stated that the detainees have been working with the National Police of Ukraine.